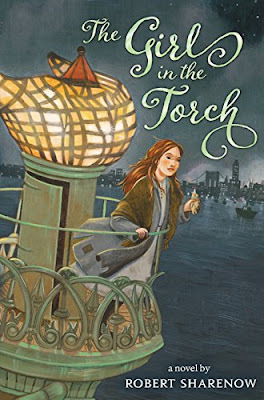 Twelve-year-old Sarah has always dreamed of America, a land of freedom and possibility, and the beckoning Lady Liberty. When Sarah and her mother finally journey across the Atlantic, though, tragedy strikes—and Sarah finds herself being sent back before she even sets foot in the country. She daringly jumps off the back of the boat and swims as hard as she can toward the Lady's island and a new hiding place: the Statue of Liberty. Now Sarah must find a way to Manhattan while avoiding the night watchman and scavenging enough food to survive. When a surprising ally helps bring her to the city, Sarah finds herself facing new dangers and a life on her own. Will she ever find a true home in America? This is a fascinating and beautifully detailed (albeit a tad sugar-coated) story about immigration. I guess I haven't read much from that time and place—there's a lot of wonder, heartbreak, and new experiences for Sarah, and it was thoroughly enjoyable to read about them. While there were noticeable stretches to make the story work (which the author admits to in his notes at the end of the book), I believe this is a valuable insight into that historical time period. The characters were quite varied, including Russians, Irish, Chinese, African American, and Native American. Which, yes, there were those and many other nationalities in NY at the time. It just seemed a bit overly sweet they all seemed quite happy to work with each other to help secure the fate of one 12-year-old girl. But hey, it makes for a great children's novel. I did particularly enjoy Maryk, and his tragic past; he was very well written and a good counterpart for Sarah. In the end, yes, I enjoyed it, and would recommend it to any reader or classroom. I think it's a good readalike to West of the Moon with the immigration theme.